I love selling on eBay, Bonanza, Atomic Mall and other places. Here at my blog I'm offering advice, tips, and just chatter to interested individuals. Here's some Holiday ideas you can make with twin or any size bed sheets. Christmas is coming fast and what a great way to make something unique and surprising for that special person. Click the link to see some ideas that I have. If anyone has something they have made out of sheets I'd love to see it and share with others. 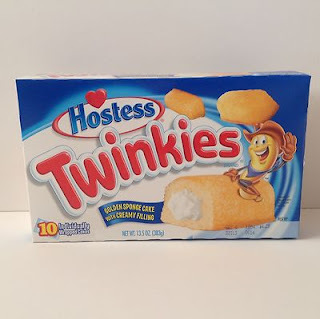 You've probably heard by now that Hostess has gone bankrupt, so guess what's the hot seller on eBay and Amazon right now? No it's not toys - Twinkies, Ding Dongs, Ho Ho's etc. people are actually paying up to $25 a box. I know Twinkies would last for ever but you can't sell them if they're past the expiration date. This is just nuts. But we all have our favorite foods and candy. I remember these as a child, the snow balls were my favorites. How many of you are connected to linkedin, pinterest, google+, facebook and your own store whether on ebay or another website. I would love to see your stores and visit them. Just post your link here. When you leave feedback for a customer include your store name. (ex. 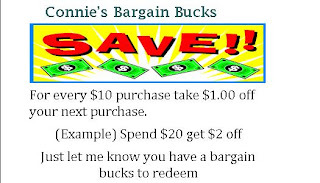 Thank you from Connie's Bargains Galore, or Come Again to Connie's Bargains Galore) this helps anther buyer when they check out feedback, plus I've had customers tell me it helped to find my store. Do you send your customers business cards and notes when they purchase items from you? What do you send? Has it brought you repeat customers? Here's some money saving coupons I give to each of my customers depending on what I sell. Excludes existing customers of Diapers.com, Wag.com, Vine.com or other Quidsi sites. Restrictions apply. Excludes existing customers of Soap.com, Casa.com, Wag.com or other Quidsi sites. Restrictions apply.